My temp gig as Lord Of The Files at Delta Dental gives me an aerial perspective on San Francisco these days. I’m working on the thirteenth floor at 100 First Street, a 27-story building which I’ve long admired for its restrained Flash Gordon Babylonian architecture. From this vantage point I have a nice view of 201 Second Street, the new tall green-glassed cube farm at the other end of the block on Mission. However, this view is almost as temporary as my job. Various official notices in Norman French posted at street level indicate that two high-rise office towers will soon be built in the middle of the block, which means that every building currently there is history. Wipeout. Is this Progress, or just Gress? There’s a little exhibit off the lobby in 100 First which has a bunch of 19th-century junk they dug up when they were excavating the site. It’s pretty funny. A couple of old boots, some broken crockery, clay pipes, lots of nails. Man, nails were very butch in those days! Back when those nails were being dropped in the sand, it was Happy Valley. The exhibit has a blowup of a drawing (circa 1849) of nothing but tents, and a photograph, two years later, showing two- and three-story buildings all over the same site, with commentary from a guy who’d been there in ‘49 and couldn’t believe the change. He ought to see it from the 27th floor! 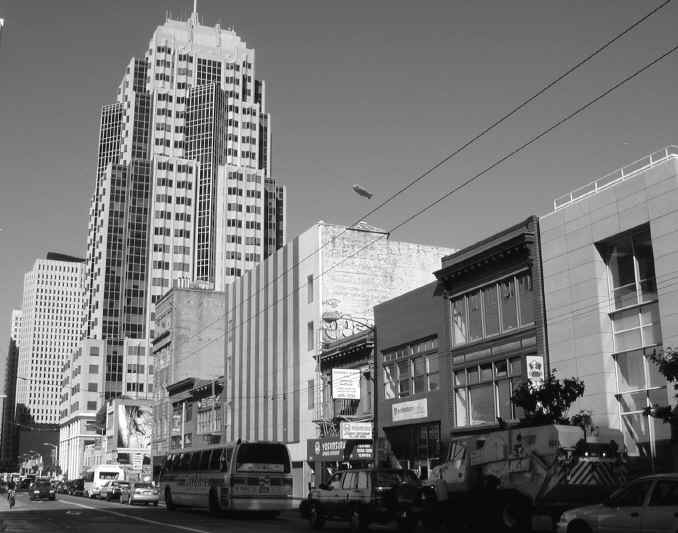 Before they built the Temple Of Dental Insurance a decade or so ago, what was on First between Mission and Minna was a row of low nondescript buildings which contained two dive bars and a pinball arcade, among other delights such as cheap, bad, pre-fast food. The food was fast until it hit your digestive system, which was no doubt a blessing in disguise. The bars were identical, except one was fun and the other one wasn’t, like Damon and Pythias. No one could ever remember the names of the bars, so you were always waiting in the wrong one to meet somebody. Ah, the fun we had in Olde San Francisco! And the Transbay Terminal is doomed as well, of course. I’ve always liked it in there. It reminded me of New York when I first saw it. Thirties terminality. I’ve actually ridden on the Bay Bridge trains. The railroad museum at Rio Vista has a couple of car sets. Squint a little and you’re on the IRT. There’s an interesting story behind those trains. The Key System was basically forced to provide the transbay train service on the bridge. They weren’t interested, but the state said, "You gotta," so they did. But they did it on the cheap. Management decided to put new car body shells on old equipment to save money, and because that still wouldn’t yield enough cars to provide the service, they specified that the rest of the order be built to the old design for commonality, despite the pleas of the manufacturer. So the car bodies were 1930s state o’ the art and looked cool, but the mechanics were from 1917, which made the cars slow, inefficient, and unimprovable. And that’s how BART was born. Eventually. I’m not nostalgic as a rule. About the only thing I really miss around town is the old Main Library. And the only time I miss it is when I’m in the new Main Library. God, what a mess that place is. Talk about functionless design! It’s the Winchester Mystery Library. But nostalgia is obsolete now. Nothing ever really goes away anymore. F. Scott said there were no second acts in American lives. We don’t need them. We have reruns. In ten years some developer will raze a square block in the Mission and put up 1949LAND, where you’ll be able to go to an authentic reproduction neighborhood single-screen movie house to see a Tyrone Power picture, dance to swing music, check your hat, bowl, eat ham and eggs, drink rye highballs, all that stuff. Genuine replica San Francisco. 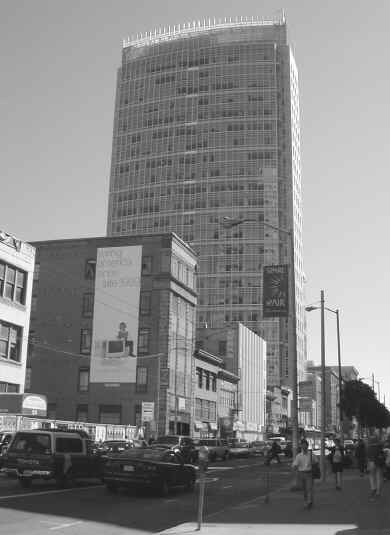 555 MISSION STREET OFFICE PROJECT. Hearing on the Draft Environmental Impact Report (EIR). The proposed project involves demolition of six existing buildings and construction of a new 31-story building (about 455 feet tall including parapet) containing about 557,000 gross square feet (gsf) of office space, about 8,000 gsf of retail space, and about 38,990 gsf of below grade parking (about 150 valet spaces in two levels). A plaza of about 11,000 sf would be constructed between the new building and the office building at 101 Second Street to the west. The project site is on the south side of Mission Street, between First and Second Streets, and within the C-3-O (Downtown Office) zoning district; Assessor’s Block 3721, Lots 69, 70, 78, 79, 80, and 81. Note: Written comments on the Draft EIR will be accepted at the Planning Department offices until the close of business on August 29, 2000.